You'll want to make sure only current team members have access to your candidate, committee or organization's ActBlue account. 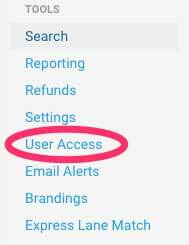 We make it easy for you to keep the list of users up to date. Visit your group’s Dashboard by selecting it from the “My Dashboards” sidebar when you’re logged in, and click on the User Access tab. Scroll to the bottom of the page and type in your colleague's email address. If they already have an ActBlue account, their name will pop up and you can click "Add User." If you want to add a user to the account who has never used ActBlue before, enter their email address and click the button that says "Create User sample@sample.com and grant access." We'll send them a link to create an account and add them as a user on your account. We know staff turnover is a fact of life. If you want to remove a user from your account, just click "Remove User" next to their email address.